What could be better than a credit card sized gold bar that is easily divisible for trade? The 50 g Gold Combi Bar contains a full 50 grams of finest .9999 gold in the form of 50 x 1 gram bars. This innovative product from Switzerland's Valcambi Mint is highly popular with investors who want a product that can be divided as and when they wish. Each Valcambi gold 50 g CombiBar is manufactured with accurate pre-determined breaking points to ensure that there is no loss of gold when separating the bar into 1 gram units. Investors choose this exciting product both as a flexible payment method and as a long term addition to pension plans and portfolios. 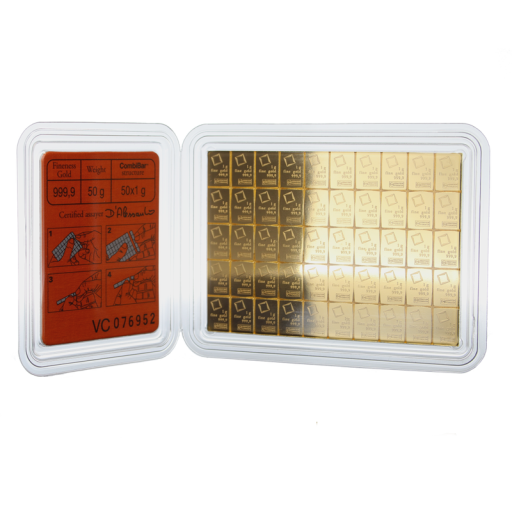 Its convenient size makes it highly portable and each 1 gram bar can be traded internationally at current gold prices. It's an excellent choice for frequent business travellers and 1 gram bars also make great gifts for family and friends. 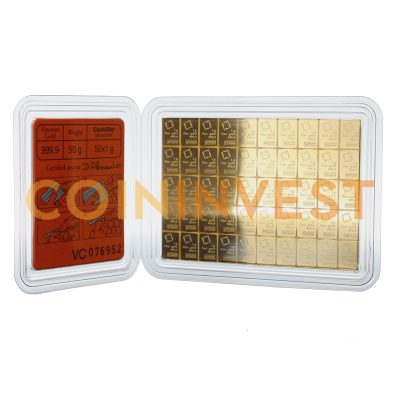 CoinInvest aims to bring you the most exciting and innovative products on a regular basis - like this gold 50 g CombiBar. The slightly higher price reflects the additional work involved in producing this outstanding product. I purchase Gold for the longer term (20 years +) as a form of personal pension outside of the system. I expect in 20 years from now, 1oz may be to large a denomination to trade with others, and this 50 x 1g CombiBar is ideal to purchase, because it is divisible in 1g bars easily for trade. I also believe if bringing gold across borders (where controls may be in place in the future) that this small square form is better suited to that purpose. While I hope and pray that the world does not go the way of my fears and I have not need for this product as insurance, it is a comfort to have it. For the above reasons I believe the CombiBar is nice insurance, and a great product, that I am willing to pay the small premium of extra processing by the manufacturer. I also have to say also that I have dealt with the CoinInvest team when purchasing this product in the past, and they do offer a great service. I like this bar and carry it as an 'Emergency' payment. As it's credit card size it fits neatly into your pocket, and you can break off how much 'payment' is required. Of course you need to keep up to date with the price of gold so you get the best return.